A mixed-methods study analysing baseline data on 747 men aged 35–65 years with BMI ≥ 28 kg/m2 who were participants in a randomised controlled trial of FFIT, and data from 13 focus group discussions with 63 men who had attended the programme. Objectively-measured mean body mass index was 35.3 kg/m2 (sd 4.9). Overall over 90% of participants were at very high or extremely high risk of future ill-health. Around three-quarters of participants in all age groups were at ‘very high’ risk of type 2 diabetes, hypertension and cardiovascular disease (72%, 73% and 80% of men aged 35–44, 45–54 and 55–64 years respectively). A further 21%, 16% and 13% were at ‘extremely high’ risk. Qualitative data revealed that the powerful ‘draw’ of the football club attracted men otherwise reluctant to attend existing weight management programmes. The location and style of delivery of early FFIT sessions fostered team spirit; men appreciated being with others ‘like them’ and the opportunity to undertake weight management in circumstances that enhanced physical and symbolic proximity to something they valued highly, the football club. The delivery of a weight management intervention via professional football clubs attracted men at high risk of ill-health. The setting enabled men to join a weight management programme in circumstances that felt ‘right’ rather than threatening to themselves as men. FFIT is an example of how to facilitate health promotion activities in a way that is consistent with, rather than challenging to, common ideals of masculinity. Obesity has ‘escalated’ in recent decades  and the prevalence in UK men is amongst the highest in Europe . More men are overweight or obese (body mass index (BMI) ≥ 25 kg/m2, 67%) than women (57%). In mid to late working life (35–64 years), more than three quarters of men are overweight or obese, and a third are obese, with the prevalence of obesity increasing with age (BMI ≥ 30 kg/m2 at: 35–44 years = 29%; 45–54 years =32%; 55–64 years = 35%) . On current trends, nearly 50% of UK men will be obese by 2030 ; these trends pose a threat to individual health (through increased risk of cardiovascular disease, diabetes and cancer), a burden on health services and a challenge to public health [1, 4–7]. A 5-10% weight loss can produce health benefits , but there are real challenges in encouraging weight loss in men. Not only is obesity rising faster in men than women, but men seldom use existing commercial and National Health Service (NHS) weight loss programmes [9–12]. Furthermore, many men seek a body weight that is not consistent with biomedical definitions of ‘normal weight’, ‘overweight’ and ‘obesity’ [13–15] and are more willing to challenge these definitions than women . Men often view dieting as ‘feminine’ [17, 18], are more likely to use exercise to control their weight , are more resistant to healthy-eating campaigns , and are less aware of links between diet and ill-health [19, 21]. Thus, as argued elsewhere , prevailing cultural constructions of masculinities are closely related to men’s decisions about health-related behaviours, including help-seeking [23–25] and alcohol consumption [26–28], as well as eating, physical activity (PA) and weight loss. These constructions are often said to be inherently health-damaging , mitigating against men taking care of their health, or putting them in an ambiguous position between wanting to care for their health as responsible citizens, without appearing to care ‘too much’ as men . Thus, with the increasingly male hue of the obesity epidemic, developing weight management strategies which are appealing and acceptable to men is a public health priority , and most likely to be successful when working with, not against, cultural ideals of masculinity. In other words, health-promoting interventions need to engage men without being an anathema to valued aspects of their identities . Other weight management programmes for men take a similar view and have shown promising results [31–33], although evidence on what works in weight loss for men is relatively sparse  given their underrepresentation in weight loss trials . In order to inform further development of weight management and other public health interventions in football club settings this paper reports firstly, on the characteristics of 747 men participating in a randomised controlled trial (RCT, ISRCTN32677491) of a weight management programme  designed specifically to attract men at high risk of ill-health due to obesity , and, secondly, their accounts (as expressed in 13 focus groups with 63 men) of why they decided to participate in the programme. Football Fans in Training (FFIT) is a men-only, evidence-based [8, 38], 12-session, weight management and physical activity group programme with subsequent minimal-contact weight loss maintenance support delivered free of charge at Scotland’s top professional football clubs by community coaches trained in diet, nutrition, physical activity and behaviour change techniques to a standard programme delivery protocol . This training included discussion of SMART goal setting and implementing the pedometer-based walking programme. Training was interactive and designed to promote the principles of adult learning and the use of banter in the group sessions to make men feel more comfortable about raising sensitive issues. Coaches shared ideas about suitable in-stadia physical activities which could be adapted to different levels of fitness. FFIT exploits the traditionally male environment of football clubs , existing loyalty to football teams and the opportunity to participate in men-only groups to maximise men’s engagement ; its development is described elsewhere . In brief, FFIT is gender-sensitised in context, content and style through its delivery at professional football stadia by club community coaches who encourage participative learning, a practical focus through shared experiences of progression towards behaviour change and a light-hearted atmosphere (‘banter’) which supports men in discussing potentially difficult issues. In addition to advice on diet, alcohol and sustainable behaviour change strategies, FFIT focuses on physical activity through an incremental pedometer-based walking programme to encourage greater activity in daily life  and pitch-side sessions led by club coaches. FFIT’s location within professional football clubs reflects growing recognition of the potential of sporting organisations to deliver health initiatives to men [40, 41]. Club community coaches receive two days training to ensure that key elements of FFIT are delivered. The mapping of these key elements onto behaviour change techniques which are effective in weight management  (e.g. self-monitoring of weight and physical activity, intention formation, goal setting and review) is described elsewhere . The results of a feasibility study  and semi-structured telephone interviews with participants in the pilot deliveries of FFIT in 2010  suggested that the programme had potential to help men to lose weight and is popular with participants. The results of a full-scale RCT, the first such study to be conducted in a professional sports setting, powered to assess whether participation in FFIT helps overweight/obese men to lose at least 5% of their body weight 12 months after baseline (pre-programme) measurement provides evidence of the effectiveness and cost effectiveness of FFIT . The data were gathered as part of the FFIT RCT . Within a 3.5 month perioda prior to start of the first delivery (August/September 2011) of the optimised FFIT programme in 13 clubs (12 in the Scottish Premier League and one recently relegated to a lower division), sufficient men were recruited to fill all available places (at that time funding from the Football Pools and Scottish Government was available for deliveries at the 13 clubs in August-December 2011, February-April 2012 and August-December 2012). Following measurement at baseline in August-September 2011 and assessment of eligibility (age 35–65 years, BMI > 28 kg/m2), 374 men were randomly allocated to undertake FFIT immediately (intervention group) and 374 to undertake FFIT 12 months later (waitlist comparison group). Men who were unable to attend baseline measures were placed on a waiting list and offered a place on the February 2012 delivery of FFIT (‘non-trial’ group) if any places remained after prior allocation to men who had attended the measurement sessions . We report the characteristics of the 747 men who took part in the RCT, excluding one man randomised to the comparison group who subsequently withdrew. Ethical approval was granted by the University of Glasgow College of Social Sciences Ethics Committee (CSS/2011/029), which complies with the UK Economic and Social Research Council’s Framework for Research Ethics. Participants gave separate written informed consent for participation in the RCT and the focus group discussions. Men were offered travel expenses and a £20 football club shop voucher as a gesture of thanks for their contribution to the focus group discussions. All objective baseline physical measures were taken in the clubs by fieldworkers trained to standard protocols . Weight (kg) was recorded using an electronic scale (Tanita HD 352), with participants wearing light clothing, no shoes and having emptied their pockets. Height (m) was measured (without shoes) using a portable stadiometer (Seca Leicester). Waist circumference (cm) was obtained using a 200 cm tape measure. At least two measurements were taken, followed by a third if these differed by ≥5 mm; the mean of all measures was calculated. Resting blood pressure (BP) was measured using a digital BP monitor (Omron HEM-705CP). Equipment was calibrated prior to fieldwork. Descriptive statistics for weight, BMI, blood pressure and waist were calculated. Categories of waist circumference (‘low’ < 94 cm; ‘high’ ≥ 94 cm and <102 cm; ‘very high’ ≥ 102 cm) and BMI (‘overweight’ BMI 28–29.99; ‘mild obesity’ BMI 30–34.99; ‘moderate obesity’ BMI 35–39.99 and ‘extreme obesity’ BMI >40) were used to assess risk of future ill-health  so we could compare the health risk of FFIT participants with similarly-aged men in the Scottish population . As part of the process evaluation of FFIT , men who had attended at least six FFIT sessions in August-December 2011 (85% of intervention group) were invited to a discussion about their experiences of FFIT at the end of the 12 weekly FFIT sessions. Of 295 men contacted, 133 (45%) indicated willingness to take part. At each club, up to 6 of these men, chosen randomly, were invited to a 60-minute discussion at the club stadium; 63 men participated in 13 focus groups. These were audio- and video-recorded with consent, transcribed verbatim, and transcripts checked for accuracy against recordings. To thank them for their time, men were offered a £20 club shop voucher and travel expenses. During the discussions men were asked about several aspects of FFIT, including why they signed up in the first place and early experiences of attending FFIT, as reported here. The focus group data were analysed using a structured, thematic approach . Transcripts were read by several authors to identify broad themes, guided in part by our research questions in the process evaluation. Transcripts were then coded to broad themes including the ‘draw’ of the football club/club setting, reasons for participating, and satisfaction with and acceptability of FFIT; coding was quality-checked by another researcher. Secondly, the content of the themes relevant to this paper was examined in detail by a third researcher. Each coded extract was read line by line to identify all sub-themes. These sub-themes were summarised schematically and each occurrence of every sub-theme was noted and compared with data from subsequent groups, using the OSOP method , which allows systematic comparison of data from different participants/groups, noting anticipated and unanticipated themes . Attention was paid to ‘deviant cases’ to ensure all perspectives were captured . We paid particular attention to a code entitled ‘negatives of club setting’; this contained relatively little material (from just 2/13 clubs) and can be summarised as disappointment that the more ‘professional’ side of the club did not show the same interest in FFIT participants that the community coaches had done. We first describe the characteristics of men who enrolled for FFIT and their risk of future disease (on the basis of their weight and body compositional measures) in comparison with Scottish men of the same age. We then present qualitative data to show what attracted men to the FFIT programme, focusing both on ‘push’ factors (such as growing health concerns, wanting to lose weight to ‘be there’ for their family in the future) and ‘pull’ factors, specifically the attraction or ‘draw’ of the football club setting. The baseline characteristics show that FFIT succeeded in attracting men at high risk of future ill health (Table 1); mean weight was 109.5 kg (sd 17.3) and mean BMI was 35.3 kg/m2 (sd 4.9). Over 90% of participants had a BMI ≥ 30; 44% were classed as ‘mildly obese’, 31% as ‘moderately obese’, and 17% as ‘extremely obese’. Mean age was 47.1 years (sd 8.0), mean waist circumference (WC) was 118.4 cm (sd 11.7); all but 2 men had a ‘high’ (4%) or ‘very high’ WC (96%). Mean systolic and diastolic blood pressure readings were 140 and 89 mmHg, respectively. Table 2 compares FFIT RCT participants with male Scottish Health Survey respondents of similar ages  according to health risk category. FFIT participants were at much higher risk of future ill-health (type-2 diabetes, hypertension and cardiovascular disease); around ten times more men were classed as being at ‘extremely high’ risk (21%, 16% and 12% of FFIT participants aged 35–44, 45–54 and 55–65 years, respectively, compared with 2%, 2% and 1% of Scottish men of the same age). A further 223/311 (72%) of FFIT participants aged 35–44, 212/290 (73%), aged 45–54, and 116/146 (80%) aged 55–65 years were at ‘very high’ risk, compared with 25%, 25% and 32% of Scottish men. Although participants were sufficiently concerned about their weight to enrol for FFIT, less than 4% had attended a commercial or NHS weight loss programme or clinic in the previous 3 months (Table 1). + Table adapted from Table 7.5, Scottish Health Survey (SHeS), 2011 (Volume 1 Adults ) to allow direct comparison with men of comparable ages in the Scottish population in 2008–2011. a Waist circumference categories according to WHO/SIGN guidance – low: <94 cm; high: ≥94 cm and <102 cm; very high ≥102 cm; b BMI categories as defined in Table 1; c Health risk category according to SIGN guidelines . What attracted men to FFIT? Having shown that FFIT attracted high risk men who were not participating in alternative programmes, we consider what attracted them to FFIT. Analysis of the focus groups revealed a combination of ‘push’ and ‘pull’ factors were crucial in men’s initial attraction to FFIT. Factors attracting men to take part in FFIT – the power of the ‘draw’ of the football club for themselves and other like-minded/like-bodied men. Even with the combined motivation to do something about their weight (a ‘push’ factor) and the opportunity to do this in a place they valued (the draw of the club, a ‘pull’ factor), some men talked explicitly about the apprehension they felt about enrolling in a weight management programme prior to arriving at the club, underlining the barriers many felt about joining a weight management group (Extract 1, Table 3). Others expressed worries in different ways, such as a fear of being so overweight, unwell or unfit that they might be rejected if they applied for FFIT (Extract 2, Table 3). Indeed, many men indicated they heard about FFIT from several sources (e.g. when approached by fieldstaff at pre-season games, adverts or features in the media or workplace, word of mouth) before deciding to enrol. M1: Aye, that was the thing, it was… Everybody was starting from the same spot. M1: The good thing was, straight from the start, we all had something in common with each other. Rather than being sixteen strangers, we’d all something in common, and that was the club and a love for it. M5: Two things in common. We were fat and we supported [Club03]. After the difficult process of deciding to at least attend the baseline measurement session, many men expressed relief during the initial stages to see they were amongst men ‘like them’ in crucial ways. They recognised themselves in the physiques and perceived levels of fitness of other men there, and they were able to take for granted a shared interest in football and the club (Extract 3, Table 3). Often their remarks about this recognition reflected the self-deprecating humour and ‘banter’ which characterised FFIT’s style of the delivery  (Extract 4, Table 3). M5: These guys [FFIT coaches]… have got an insight to the club. These guys are [Club03], through and through. They are. They’re us. They’re the same as us… It’s in the blood. M3: Aye, you get good insight into it. M6: Wee bits of banter, round, and stuff that nobody else could have told you.... you just felt as if you were interacting with guys that were a part of [Club03]. M5: We were all from different backgrounds, but everybody bonds, you know? And we’ve went fae [from] the milkman to the postman to the office worker to the sales guy, but everybody just bonded and it didnae matter whether you were from Falkirk or from Glasgow. M5: There’s an ownership wi’ the club, or I suppose ‘ownership’ is probably not the right word, but you definitely feel a connection to the club that you maybe didn’t have before. Even just the t-shirts we all got. The feeling that the programme was ‘right’ for them was further reinforced by what men said that FFIT was not (Table 4). In emphasising that FFIT was not for women, not Weight Watchers or Scottish Slimmers, not a diet club, and so on, the men underlined how FFIT enabled them to take on what might otherwise be seen by themselves (or others) as a feminised activity (deliberate attempts to lose weight) and reclaim it as something which enhanced their sense of themselves as men. M1: That’s right. I think the majority felt that Weight Watchers was not for us. That was very much a women’s thing. M2: That’s a ladies’ thing. M1: And, sorry for being sexist, here, but it’s, I think the majority felt no, Weight Watchers or Scottish Slimmers or whatever. M5: They’re always targeted at women. M1: Was targeted for women. It was never targeted for men… And even a lot of the exercise classes that gyms run are targeted for women and not for men. M3: I think ladies, to come to something that we’ve been on for the twelve weeks, wouldn’t maybe appreciate the language that’s used. You know, it’s all guys that’s there and, you know, it’s football. M2: Yeah, you see ‘cos, it was not exactly industrial language, but there was the odd bit of comment and football slagging and stuff like that. And yeah, we would laugh it off but somebody [?a woman] might not. M3: They might take offence to it. M1: I mean, the common denominator is football. We all like football, you know? And that gets us all going. M4: Of course it does. M1: Well, I would never go to a gym, to be honest. I’ve tried. Kept saying I was gonna do it, but I would have mucked about on my own for a while and I still wouldnae have done anything. But the fact it was [Club05] Football Club you were going to made it more palatable, you know? M3: Doesnae matter what club, ken, and if you’re into that club, I think you’d go, and it would spur you on. Rather than Weight Watchers. M1: The fact we got a top, as well, I think, you know? You had a training kit and the training top on and things like that, you were always quite. M1: From day one, it was stressed in here, this is no a diet, it’s not a diet. With male levels of obesity rising, and men’s lower participation in existing weight management programmes , the need for innovation in the design and delivery of programmes to attract overweight/obese men has been recognised [31, 33]. Professional sports clubs, and specifically professional football clubs in the UK, are increasingly seen as settings that can attract men to health promoting activities [41, 46]; Pringle and colleagues suggest that “the product (i.e. football/EPL [English Premier League])… the place (club stadia and facilities), people (players and management) and processes (including communication, marketing and the product delivery infrastructure)” all contribute to their appeal . If this ‘draw’ is to be used to maximum public health benefit, it is important that programmes delivered in these popular locations are based on best-evidence about what works, and reach those men most likely to benefit. Behavioural ‘choices’ are embedded in socio-cultural contexts, including those relating to gender, yet gender is often ignored in intervention development, perhaps explaining underuse by men (only 10-30% of participants in weight loss programmes are men [9–12]). This paper shows that FFIT, a gender sensitised, weight management programme delivered to standardised protocols across all participating clubs , has succeeded in attracting men whose weight and body composition puts them at very high risk of ill-health, and thus adds further evidence of the potential of the professional football club setting for attracting men to health-related initiatives, including weight management. In explaining why FFIT succeeded in attracting them, men provided multiple and overlapping explanations for enrolling. 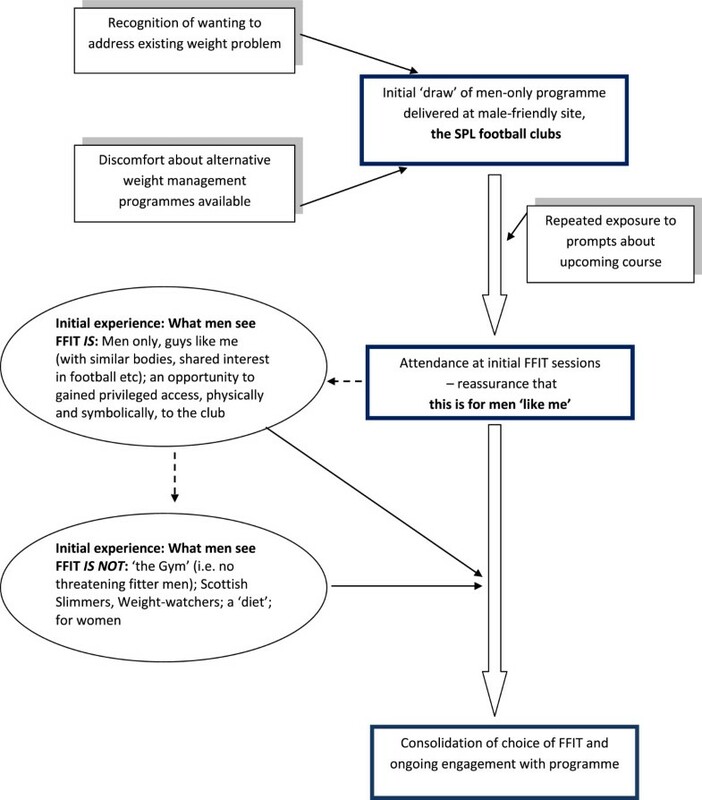 These included ‘push’ factors in their personal and family lives and experiences, such as growing health concerns, wanting to lose weight to ‘be there’ for family, or to regain sufficient fitness to restart valued activities; and ‘pull’ factors, in this case specifically the ‘draw’ of the delivery of FFIT at football stadia. The COM-B framework for understanding behaviour change  suggests that people require capability (physical and psychological capacity to engage in behaviour, including skills), opportunity (external factors, including the physical environment and ‘social opportunity afforded by the cultural milieu’), and motivation (habitual processes, emotional responses, goals and conscious decision-making) to undertake behavioural change. We would argue that the professional football club setting appears to have provided these men with a physical and social opportunity which matches well with their own identities and values as men. The fact that FFIT attracted like-minded men with similar physiques and levels of fitness (‘people like them’) contributed to the appeal of the group format. In relation to the COM-B model, men’s accounts suggested they wanted to, and were motivated to, lose weight for whatever reason and that the FFIT programme was an ideal opportunity. Our attempts to ‘gender sensitise’ FFIT in context (professional football stadia), content (e.g. specific sessions on alcohol and weight, ‘branding’ with club insignia on programmes and club-based t-shirts) and style of delivery (participative, peer-supported, learning which encouraged male ‘banter’) appears to have worked in terms of engagement; the results of the RCT demonstrate the effectiveness of FFIT in achieving clinically significant weight loss at 12 months . Assertions that men undertake ‘risky’ behaviours (such as smoking and drinking excessively) and avoid health-protective behaviours (such as help-seeking) to be ‘real’ men are commonplace , and constantly reinforced in popular media and day-to-day interactions. Vandello and Bosson argue that “people view the very state of manhood as a precarious social status that is hard won and easily lost, [requiring] continual public demonstrations of proof” (p101) . This resonates with other conceptualisations about how people demonstrate in their day-to-day social interactions that they are behaving in ways that are appropriate for their gender . De Visser and colleagues, for example, argue that taking part in activities which are deemed to be ‘feminine’ is one way in which men can ‘lose’ man points  or ‘masculine capital’  (in which ‘masculinity’ is seen as a resource accumulated through social interaction that can be enhanced, undermined or destroyed by certain actions and behaviours). Because dieting and taking part in commercial weight loss programmes are so often constructed as ‘feminine’ activities [17, 18, 20, 31, 32, 52], it is perhaps no surprise that men are more willing to engage in programmes that give them the easy opportunities to revalidate their credentials as men. This paper reinforces earlier evidence that FFIT is valued by men who want to lose weight, not just because it is enjoyable and engaging, but because it enables men to ‘bolster’ their masculine capital through their association with football clubs, symbolically and physically, and their participation and association with other men like them. The study has a number of strengths. Weight, height, blood pressure and waist circumference were objectively measured by fieldstaff trained to standard protocols who were independent of the clubs delivering FFIT, as were the researchers who facilitated the focus groups. This illustrates that whilst others have acknowledged the challenges of evaluative research in these contexts , it is possible to obtain objective measures and use evaluative designs (the ‘gold standard’ RCT) that normally reside more comfortably in clinical settings. The study also has limitations. Focus group participants were men who had completed the majority of FFIT sessions, and were willing to volunteer to make an additional trip to the club. It is thus possible their views are more positive than other participants. On the other hand, the location of the discussions may have been seen as a positive opportunity to meet fellow participants in a venue they enjoyed coming to. Certainly, the views expressed are consistent with those gathered via shorter telephone interviews with men who undertook the pilot deliveries of FFIT in August-September 2010 , with comments reported back by fieldworkers at the follow-up measurement sessions, and with feedback from the coaches. This mixed-methods study has shown that the delivery of a weight management intervention via professional football clubs attracted men who were at very high risk of ill-health, the majority of whom did not attend other weight management programmes. The familiar and valued football club setting, the opportunity to interact with others ‘like them’, and the gender-sensitised content combined to reassure men they were in the right place and to support their engagement with the programme. Football Fans in Training provides an excellent example of how to facilitate weight management in a way that is consistent with, rather than challenging to, common ideals of masculinity. aFormal recruitment began on 2 June 2011 when funding for the RCT was confirmed. Men who had already enquired about the study in response to publicity about the pilot deliveries of FFIT were contacted once formal recruitment began. We are grateful to: the FFIT participants who took part in the research; the community coaches in the football clubs; the survey and fieldwork teams at MRC/CSO Social and Public Health Sciences Unit, University of Glasgow, in particular Catherine Ferrell, Elaine Hindle, David Walker and Alan Pollock. Many people contributed to the development of FFIT. We would particularly like to acknowledge current and former colleagues at the Scottish Premier League Trust (Euan Miller, Billy Singh, Mark Dunlop, Stuart MacPhee), Jim Leishman and colleagues at the Camelon Men’s Health Clinic, Professor Nanette Mutrie and Professor Annie Anderson. We would also like to thank staff at the Tayside Clinical Trials Unit at the University of Dundee for data entry, and Petra Rauchaus for preparation of statistical data. This project was funded by the National Institute for Health Research Public Health Research (NIHR PHR) Programme (project number 09/3010/06). The views and opinions expressed therein are those of the authors and do not necessarily reflect those of the NIHR PHR Programme or the Department of Health. KH and AM are funded by the Medical Research Council (5TK50 / 25605200–68094). KH, CMG and SW contributed to the research design. AMc and SS led data collection at the club stadia, with support from KH, CMG, and SW. KH and CMG performed the frequency analyses. KH, CMG, CB and SW read transcripts. KH performed the main qualitative analysis presented in this paper with additional input from CB and SW. KH drafted the manuscript. All authors commented on drafts, and read and approved the final manuscript.